The gun lobby only dropped the Florida Senator from an A rating to a B+, but the 2007 episode reveals just how much fealty it demands from the politicians it supports. For most of his political career, Republican presidential contender Marco Rubio earned top marks from the National Rifle Association. After he was elected to the Florida House of Representatives, where he served from 2000 to 2008, he received an A rating from the organization, which he maintained throughout his tenure there. The designation was a reminder that he was a staunch defender of the Second Amendment, and had the bona fides to prove it. Rubio’s record included votes in favor of controversial laws such as Stand Your Ground, which granted legal protections to Floridians who use deadly force to respond to a perceived threat. There was one blemish, however, on his NRA report card. When Rubio held the House speakership, from November 2006 to November 2008, he found himself in a complicated situation. Not long after he secured the powerful state post, a nine-year-old girl was killed with a stray bullet in Miami’s Liberty Square, a poor and notably violent area in the city. Rubio made a statement after the killing, saying, “We sit on a crisis of epic proportions.” He admonished himself and others for growing complacent. “We need to do something different,” he said. The following year, the NRA made a big push to pass a law that would allow Floridians who owned guns to leave them behind in their cars when they went into their workplaces. The legislation was at odds both with the state’s business community and its residents in general, 80 percent of whom, according to a poll conducted at the time, believed business owners retained the right to decide what was and wasn’t allowed on their property. 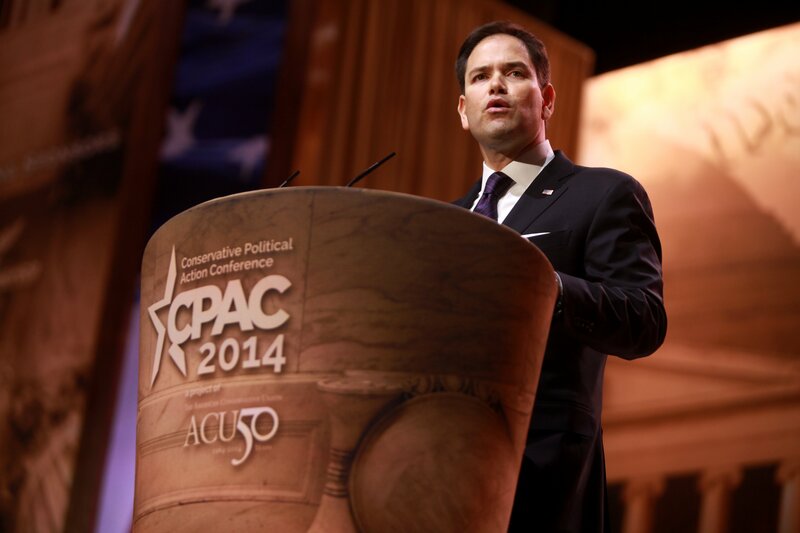 During his first year as Speaker, Rubio avoided taking a public position on the issue, to the NRA’s displeasure. By the end of the legislative session, the bill had died on the vine. In 2008, the guns-to-work bill came up again. The NRA was determined to get it passed. The scope of the legislation had been narrowed, and now only permitted those with concealed carry permits to keep their weapons in their vehicles. The business community again rallied against it, asking members of the state legislature to vote no. Rubio managed to win the Senate race anyway. One of his to-dos before running for president was getting back into the organization’s good graces. On Capitol Hill, he has become a passionate defender of the Second Amendment. After the mass shooting in Newtown, Connecticut, he voted against expanding background checks. In 2014, he gave a rousing speech at an NRA conference and said, “The safety of our families is not something people should hope government can provide.” And toward the end of March — shortly before he announced his White House candidacy — he introduced the “Second Amend­ment Rights in the Dis­trict of Columbia” act, which would make it easier for residents of Washington, D.C. to obtain firearms. The confessed Russian agent told an Israeli audience in 2013 that her gun rights group had a deal with the NRA. Plus: Mother Jones and The Trace uncovered more photos of Maria Butina’s boss with NRA leaders — including at an NRA fundraiser.